Why not treat yourself to a stunning contemporary veranda glass extension. 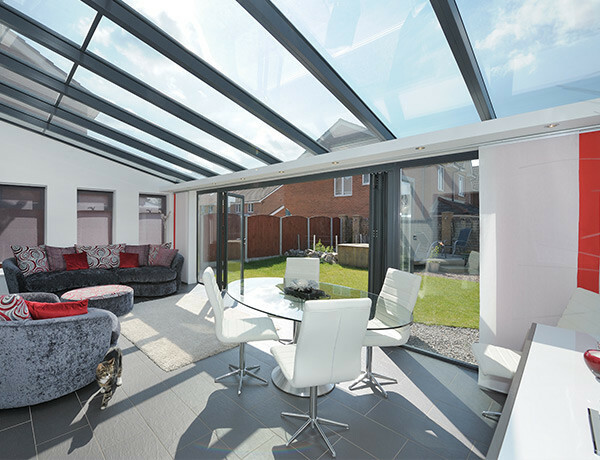 This dynamic conservatory combines the spacious indoor living space with the outdoors. With full height side walls maximises the light into this stunning conservatory. Combined with a huge range of doors, such as the uPVC bifold, Aluminium Bi-fold, French Doors or Patio doors, allows you fully customise this glass extension creating the perfect room. The roof glass is secured by striking glazing bars, which full protects the homeowner from the outside elements whilst fully appreciating the outdoor garden view. To complement this stunning full glazed conservatory, are the powder coated half round beams. These beams offer structural support to the glazed roof and glazing bars, whilst acting as an integral gutter for the conservatory. Glass extensions are an ideal way of adding value to your Peterborough home. Our modern glass extension will complement the rear of your property while you escalate the outdoor living all year round, regardless of the weather. With the latest double glazing technology, removes that traditional idea of unbearable heat in the summer and too cold in the winter. Whether you are looking for an integrated glazed extension for your living space, or an architectural feature for your home, we can offer a bespoke solution for you.